So are we really going to say that liberal arts are gone from Apple because of an ad designed to show off the amazing industrial design of the iPad Air? Let’s be serious. My disconcernment was not only with the iPad Air ad, but with the entire keynote. Everything was about Apple, from the opening repeat video to the self-praise for free to the ridiculous demo about the Eddy Cue poster. What was absent was any demo or discussion about the way humans might actually use Apple’s products for real (the Life on iPad spot being the clear exception). My argument was about the iPad, not the iPhone. I have written that Apple’s strategy and storytelling around the iPhone are spot-on and a good idea. Moreover, I think Apple is doing great things with the Mac, upping the software value prop and lowering the price at a time when Windows has never been more vulnerable in the consumer space. It’s the iPad, though, that is devoid of a story (in fact, as Pavan Rajam points out, Apple has not done a single on-stage demo for the iPad this year). The difference in clarity and specificity between Apple’s iPhone strategy – increase value, both in features and in higher order benefits – and whatever it is they’re doing with the iPad is reflected in the marked contrast between the humanity of the spot Warren references and the abstract iPad Air ad. 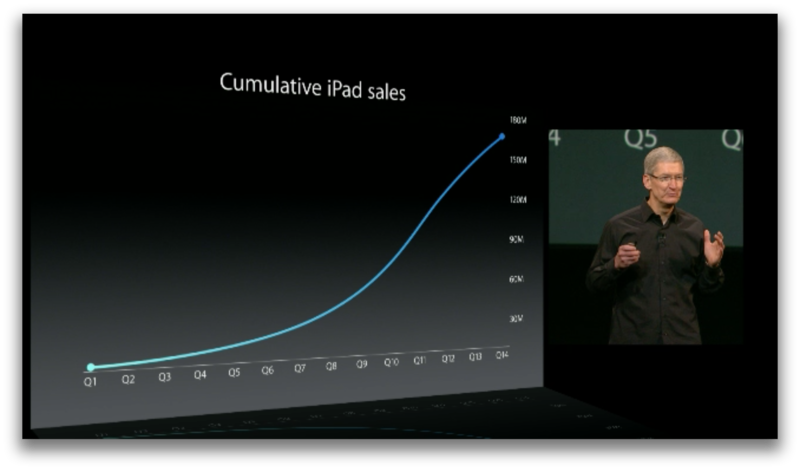 That line is flattening much too soon for a product as truly revolutionary as the iPad.1 It is not obvious to customers what the iPad is and why it matters. There is no one in the world better at “What” than Jony Ive, and no one better at “How” than Tim Cook. But who at Apple knows “Why”? Previous post: Whither Liberal Arts?